Thirsty Pilgrim: Fresh Beer and Fresh Fish. Here is a nice reminder from Costa Rica that momentum toward better drink is inextricably linked to the momentum toward better food. Some countries move faster than others, that's all. First, a bit about Product C: It's a distributor of fresh seafood, which in itself is a remarkable thing in Costa Rica. You might be surprised to learn how hard it can be to find fresh, local seafood here... For example: I bought some squid the other day. The supermarket gave me two choices: frozen stuff from Costa Rica or fresh stuff from Chile, of all places. The latter cost literally six times as much. Welcome to the oddities of food distribution. So: The story goes that chef Demian Geneau founded Product C because it was otherwise impossible to source fresh Costa Rican seafood. So he up and did it himself. The company took off and has launched a couple of outlets where you can buy the stuff to take home or, better yet, sit down with a glass of wine or beer and have them cook it up for you--an option I highly recommend based on our visit to the one in Santa Ana. 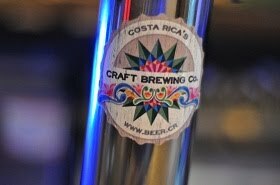 Here's the news for us thirsty types: As Brandon Nappy reports, the Product C in Santa Ana has added draft beers from Costa Rica's Craft Brewing. And it's easy to imagine how well that crisp blonde Libertas would go with some pargo entero done right. Great, very true, article Joe. the best seafood in San Jose, charming place, great and different menu. We've been back a few times now. I've enjoyed some dishes more than others, but we've never been disappointed. Looking forward to trying out the new location at Avenidas Escazú.